Explore Evia on this walking and cruise trip joining Captain Thanos on board his traditional Greek sailing boat. Cruise to beautiful bays and small harbours, with walks to hillside villages, through olive groves and to ancient sites. Join trip at Athens International Airport. We then travel by bus to the port of Rafina where we catch a ferry to the island of Evia. On arrival it is a short taxi / minibus ride to Karystos where the caique is moored. Today we travel towards the Archipelagos of Petali, where seven private and exclusive islands offer the best of the 'Jet Set' in the Aegean. Once the summer residence of the Greek Royal family, today it is the playground of the Picasso family, the Embiricos family and other shipping tycoons. Maria Calas spent many summers here. We will have opportunities to swim from the boat throughout the day before arriving in Panagia, via the Fjord of Almyropotamos. Here we will visit the beautifully frescoed church and take a look at some of the 2500 year old olive trees. Panagia is a small, traditional fishing village lying in the shelter of a fjord. From the harbour we drive up country lanes and tracks first to the village of Zarakes and then Argyro (400 m), where the tiny red-roofed houses are dwarfed by the mountains above. From here we descend to the coastal hamlet of Agios Dimitrios and walk back along the coastal road to Panagia. This afternoon cruise to Eretria, one of the best well known cities of ancient Greece, the birthplace of our alphabet - wrongly named Latin. Today's 10 kilometre walk is expected to take around four hours with 400 meters ascent and descent. Today we visit the local archaeological site and museum then climb up along the forest path to the summit of Castelli HIll (120 m) and discover the remains of the ancient acropolis there. Later we descend back to the port to enjoy our evening on the long cosmopolitan promenade of the town watching the small ferries coming and going to the mainland. Cruise to Nea Styra, an area of stunning beaches and coastline. Today's five kilometre walk is expected to take around three hours with 120 meters ascent and descent. This morning we take a transfer to the start of our walk in the rolling hills above the small summer resort, by the stone prehistoric 'Dragon Houses' (400 m). From here we walk down ancient paths and through olive groves to the Valley of Styra and back to the harbour. As the sun sets cruise to Marmari. Today we take a transfer to the start of our walk in the village of Kampos where the vineyards of the island grow. From here we walk round the headland of Lycorema to Marmari on local paths, through agricultural land. Marmari is a small port and fishing village with small tavernas and cafes dotted along the waterfront. 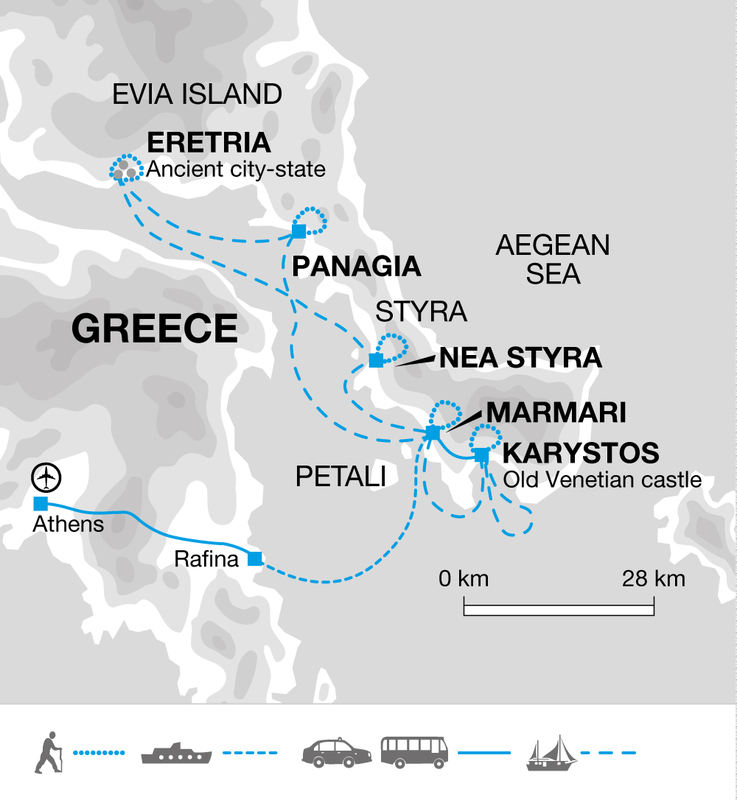 In the afternoon we will sail around the headland to Karystos. Today's 10 kilometre walk is expected to take around four hours with no noticeable ascent or descent. After breakfast we take taxis to Mili where we begin our walk up to the villages of Gourna. These traditional villages sit beneath the imposing peak of mythical Mount Ohi. Continuing along paved paths and dirt track we arrive at the old Ventian castle 'Castello Rosso' (400 meters) and enjoy the views back across to Gourna and Mount Ohi, and down to the coast, returning to the boat. Tonight we will overnight in a small hotel in Karystos. Today's 10 kilometre walk is expected to take around five hours with 400 meters ascent and descent. Today we leave Karystos and take the short taxi / minibus ride back to the ferry for the journey back to Rafina. From Rafina we are transfered to Athens International Airport where our trip ends. Optional excursions will need to be paid for in cash. Bring light and comfortable clothing that can be layered according to the temperature. The summer months are the hottest, though the islands are freshened by cooling winds. Early and late in the season there may be an occasional shower and you will need a warmer sweater/fleece and long trousers for the odd chilly breeze whilst walking, in the evenings and when travelling between the ports.Tops made from wicking materials which keep you drier and walking trousers are preferable to trousers of heavier material such as jeans. We recommend you bring walking boots with ankle support- leather or fabric are both fine. Make sure that your boots are worn-in and comfortable before the start of the trip. Footwear is not generally worn on board but bring walking sandals for local shore excursions. We suggest that on international flights you either carry your walking boots in your hand luggage or wear them - should your luggage be lost or delayed, your own boots are the one thing that will be irreplaceable. Space is limited on board so only bring what you need. A soft bag is strongly recommended as it is more easily stored than a hard suitcase. A 20-30 litre day sack is recommended. You will need to carry what you need for the day which may include a jumper, camera, sun-cream and water. Please note that if you intend to sleep out on deck on some nights, as many travellers choose to do in good weather you need to bring a sleeping bag with you (the sunbathing cushions are available to sleep on the boat but cabin bedding can't be taken on deck). Although entirely voluntary, tipping is a recognised part of life in this region of the world. Some local staff will look to members of the group for personal recognition of particular services provided. Please allow £10 for tipping the boat crew at the end of the trip. Our boat has a large sundeck on the bow and space to sunbathe on the top deck, a cool and airy indoor galley and dining room, shady spots outside under a canopy, and a boat ladder for swimming. Between the floors of the caique are quite steep ladder type stairs with hand banisters. Sunbathing mats and snorkelling gear are provided. A safe for your personal valuables is available in the wheelhouse and complimentary Wi-Fi is available on board at all times. For 2020 dates there are two single cabins available per departure, once sold there are no more available. If the departure is not full and there are spare cabins you might find that other single travellers, booked on a twin share basis, may be allocated on default a single cabin without paying the additional supplement cost. 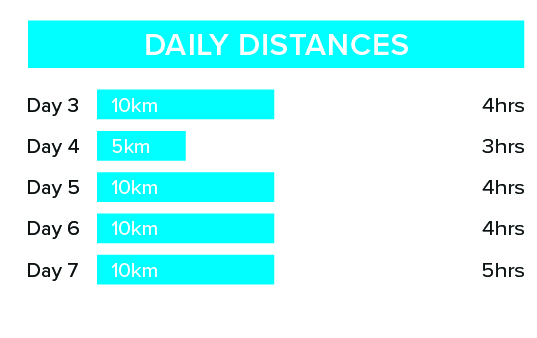 Walks on 5 days for between 3 to 6 hours. Walk on country lanes and tracks through agricultural land and along old stone paths.